During the war years, Stanmer woods was occupied by Canadian soldiers. In the late 1940s their Nissan huts were still evident by their shape; covered with ivy and mistletoe, they had mellowed into the landscape. After the troops left, the woods were deserted and became overgrown, particularly underfoot. Coldean Lane ran, as it still does, on the south perimeter. As children we were made aware of the danger of entering this fascinating place from this area. Black and white notices, stark against all the greenery, declared; ‘Danger Keep Out MOD property‘. In my mind’s eye, these notices also showed a skull and crossbones. But maybe the dire warnings of unexploded bombs, and the fact that one of my more daring playmates stepped on an unexploded device, has given exaggeration to my memory. This is a beautiful spot in any season but in springtime it becomes spectacular. The beech trees, first to come into leaf, the light green of the leaves shimmering in the warm sun, making one of nature’s perfect paintings as they contrast with the bark on the trunks of the many silver birches. 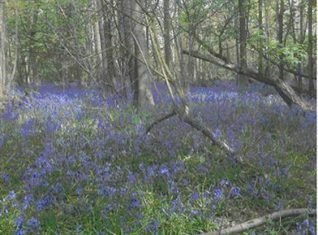 In late spring as the carpet of yellow celandines and white wood anemones finish blooming the woodland floor becomes covered by thousands of bluebells. Such a wondrous sight, it is impossible to imagine that war ever existed there.